Here is your rare chance to own a coveted piece of beach front property along the Southern California coast in the sought after 'Queen's View' beach front complex! This amazing ocean view home has gorgeous hardwood floors, remodeled kitchen with granite counter tops and stainless appliances, custom lighting, custom designer paint and more! Terrific open floor plan with large picture windows to allow for natural light also enhance the beautiful ocean views from every room! You will love relaxing on your balcony while taking in the coastal ocean views! The Queens View has recently completed a gorgeous pool deck and lobby enhancement and affords secure entry with onsite cameras along with gated secure parking for residents. Central heat and A/C are included too! The beach front Queen's View complex offers:direct beach access, pool, spa, sundeck, BBQ area and more! This is a rare opportunity to own a home with ocean views and direct beach access at this price! Come own a rare piece of the California Gold coast! FHA,VA loans approved! 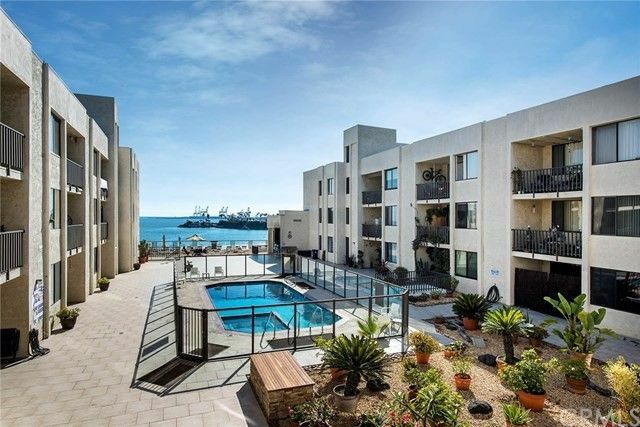 With miles of boardwalk and nearby East Village Arts District,Metrolink,Pine Ave. and Belmont Shores entertainment and transportation are just out your front door! Here's your chance to live the California dream on the beach, so make it a reality today! Directions: E. Ocean Blvd. to 4th Pl.